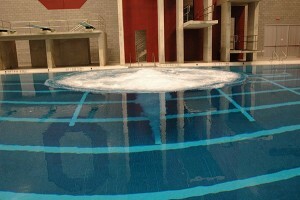 Pulsair’s pool bubbler sparger system works by injecting clean, compressed air through a long stainless steel diffuser. The diffuser is located on the bottom of the diving pool in the area where the diver enters the water. Thus, the coach or instructor can activate the air spargers from a wireless hand-held remote right from the pool deck to release the compressed air. The .05 – .30 second air release softens the water surface so the diver can have a safe and gentle water landing regardless of the entry angle. The air compressor, Pulsair controller and associated valves, pipes & equipment accessories are typically located inside a pump room or utility area out of sight from the pool deck. Pulsair’s pool bubbler sparger can be installed permanently during new pool construction or pool retrofits. Portable diving bubbler systems are also available for existing pools.